Contact our office 1-800-281-5010 to schedule a chat with one of our doctors. Step 2. In person Consult, Physical Exams, Metabolic Exams, Xray and Optical Imaging and Recommendations. Scoliosis is a genetic problem that worsens during the most metabolically active times of life. Treatment must address the underlying Metabolic condition to successfully change the natural history of the condition. Treatments are recommended depending upon the expected metabolic activity of the patient. Testing such as Dexa Scanning and Blood chemistry may be necessary. Bracing, exercise and bone nutrition must be applied simultaneously in an intensity sufficient to stimulate mechanisms of genetic adaptation. Your Follow up care is typically scheduled once every three months. Ongoing patient care includes exercise training (+) follow up imaging (+) continued monitoring of your blood chemistry, (+) adjustments to your custom made orthotics and braces (spine and shoe). Scoliosis Treatment for Juvenile Scoliosis– Due to the typically long duration of treatment, our doctors may recommend a Flexible “Day Brace” worn full time (20hours per day), which allows for improved quality of life. 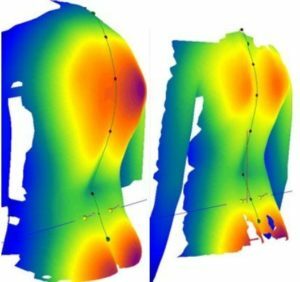 In the event the curvature worsens, our doctors may recommend a combination therapy which includes a rigid night time scoliosis brace as well. Scoliosis Treatment for Adolescent (Pre-pubertal) Scoliosis– 20 hours of Spinecor brace wearing per day. In juveniles or Adolescents who are approaching their major growth spurt our doctors may recommend a combination therapy of a Rigid night brace (+) postural therapy (+) the Schroth Method for Scoliosis. Scoliosis Treatment for Adult Scoliosis 4-12 hour of Spinecor brace wearing per day. When pain is a significant issue, our doctors may recommend an adult scoliosis brace (custom fitted tension orthosis) as the primary form of treatment. When pain and posture are stable, a combination therapy may also be recommended. Click on the button below to schedule a Complimentary Scoliosis Phone Consult with one of our doctors to find out if our treatments are right for your scoliosis. This entry was posted on February 20, 2014 by strong-admin.